Earshot Jazz is pleased to present titan of modern jazz, Eric Revis, with all-star quartet Kris Davis, Chad Taylor, and Ken Vandermark. From a schooling as fine as any modern jazzman could hope for, Eric Revis has graduated to a prominent position in performance and composition. After studying with Ellis Marsalis in New Orleans and Texas, the bassist backed legendary vocalist Betty Carter in the 1990s and then became a fixture of Branford Marsalis’ group. Early in his career, Revis performed with a who’s-who of the leading lights of modern post-bop and funk-oriented jazz: Branford Marsalis and his Cannonball Adderley-inspired Buckshot LeFonque project, Chicago neo-bop trumpeter Russell Gunn, and the band of drummer Jeff “Tain” Watts, among them. He has performed with legends like Lionel Hampton and McCoy Tyner, and neo-traditionals like JD Allen, Russell Gunn, and Winard Harper, but also eminent modernists like guitarist Kurt Rosenwinkel and the most torrid avant-gardist of them all, saxophonist Peter Brötzmann. In creating four albums between 2009 and 2013, Revis’ unit with pianist Orrin Evans and drummer Nasheet Waits, Tarbaby, has called on a roster of jazz heavyweights. Revis has recorded another four discs with cutting-edge pianist Armen Nalbandian. Along the way Revis also emerged as one of the most impressive of jazz composers and bandleaders in his own right, composing and performing distinctive, varied music of his own that incorporates much of jazz history and plenty of its future. He began in 2004 with Tales of the Stuttering Mime, and since then has issued a stream of highly acclaimed trio and quartet recordings, rich in their compositions and varied in their instrumental palettes. He has harked to the historical expanse and cultural associations of the art form by incorporating such elements as melodica, string quartet, and washboard. Laughter’s Necklace Of Tears appeared in 2008, followed by Parallax (2012), City Of Asylum (2013), In Memory of Things Unseen (2014), Crowded Solitudes (2016), and Sing Me Some Cry (2017). Revis has called on the likes of pianists Jason Moran and Kris Davis; saxophonists Ken Vandermark, Bill McHenry, and altoist Darius Jones; and drummer/percussionists Nasheet Waits, Andrew Cyrille, and Chad Taylor. The diversity of those collaborators reflects the range of styles Revis has incorporated into his compositions. As many critics have observed, in his explorative approach to writing and performing music he is informed by the past but not bound or limited by it. His arrangements are melodic, assured, wih plenty of color, hue, and interest for fans of both straightahead and direction-changing jazz. His collaborators consistently excel in both enrichment of jazz traditions and embrace of extemporaneous invention. In recent days, and for his Seattle appearance, that expansionism comes from three players with sterling pedigrees. Kris Davis has established a mighty reputation on piano in New York jazz circles. Her 2017 Downbeat rising star award came somewhat belatedly, because by then she had 10 albums as a leader, including the highly regarded 2016 release, Duopoly. Her skills have made her a valued bandmate of the likes of John Zorn, Terri Lyne Carrington, Craig Taborn, Don Byron, Tyshawn Sorey, Michael Formanek, Tony Malaby, and Mary Halvorson. Drummer Chad Taylor co-founded the Chicago Underground ensembles after beginning his career in his teens in Chicago. 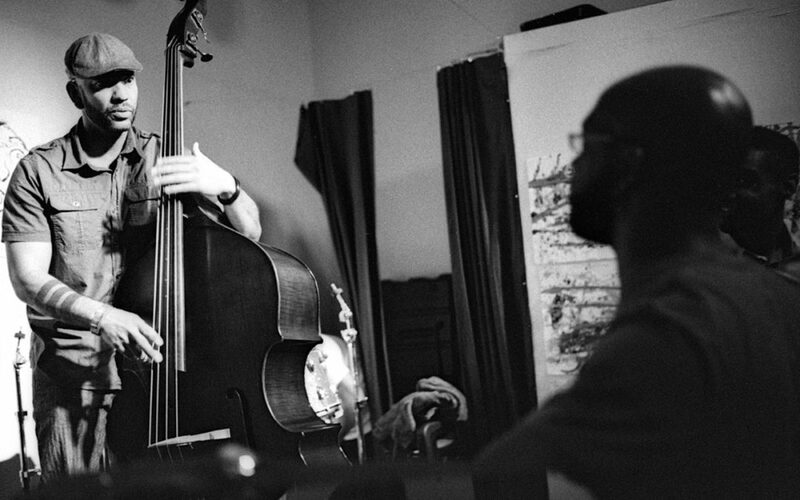 Among leaders to call on his talents have been Fred Anderson, Derek Bailey, Cooper-Moore, Pharoah Sanders, Marc Ribot, Peter Brötzmann, and Malachi Favors. Saxophonist Ken Vandermark was a catalyst of cutting-edge jazz in Chicago, exploring the terrain of free jazz and experimental music long before the MacArthur Foundation honored him with one of its famous no-strings-attached fellowships. In search of new collaborations and new fields of musical exploration, he travels constantly throughout North America, Europe, and Japan, and wherever he plays is acclaimed. General admission $20, Earshot members/seniors $18, students & military/veterans $10. Tickets and more information at earshot.org.